The second trailer, released today, reveals a much darker wizarding world. As the heart-pounding music swells, we see Harry and his friends battle the Dark Lord, show their best "emotional acting" faces and deal with some pretty heavy stuff. Watch it after the jump. Ron, Hermione and Harry -- or the trio -- look worn out and worse for the wear. The cinematography and mood created by the trailer gives me high hopes that the film will be a beautiful roller coaster, and one of the best 'Harry Potter' movies to date. So what actually happens in the new trailer? Among the clips you'll see: Voldemort sitting at a table of Death Eaters as Snape says, "We've taken over the ministry," Voldemort declaring he must be the one to kill Harry Potter, shots of the trio walking across a sweeping English countryside and, later, Apparating into oncoming London traffic, and multiple "Harrys" being created for protection of the real deal. And if that wasn't enough, there are also flying motorcycles and dragons, snakes, fires, lightning, house elves and text that reads "Only one can live." It's enough to give any Potterhead the chills. 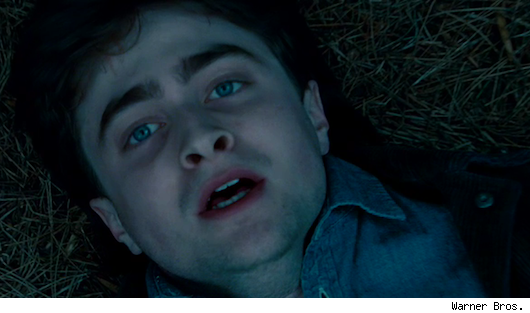 'Harry Potter and the Deathly Hallows Part 1' hits theaters on Nov. 19. Check out the trailer above and tell us what you think in the comments.